On June 5th, 2015, Chicago Center for Contemporary Theory (3CT) will host an event featuring a tour of Buky Schwartz’s 1974 Untitled sculpture. 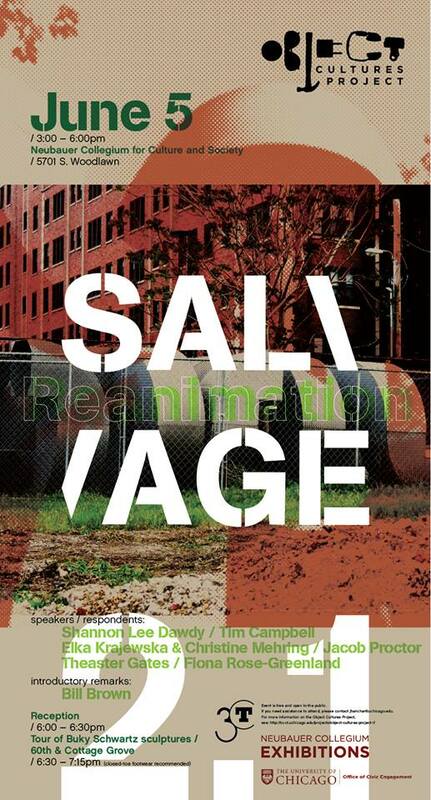 The event will be presented by two practicing artists, an art historian, and an anthropologist, discussing salvage art, reanimation, and the significance of these concepts for their respective disciplines and practices. Christine Mehring, our panel’s art historian, will be co-presenting with Elka Krajewska about their collaboration to reanimate Buky Schwartz’s Untitled modular sculpture at Cottage Grove and 60th. Mehring is the Department Chair and Professor of Art History and the College at the University of Chicago. Her research interests include abstraction, art and design, postwar Western Europe, German art, relations between new and traditional media.